Chassis management and appointment times seen as targets for fixes as Los Angeles grapples with container delays. The Port of Los Angeles aims to speed up container movements amid ongoing reports of delays at the busiest U.S. port. But the proposed solutions, including better chassis management and truck appointments, show little in the way of quick fixes. The delays come as the Los Angeles port handles more freight than any other in the U.S. Through November, the port’s year-to-date volume has reached 8.55 million TEU. But that volume is essentially flat while other West Coast ports grew volumes this year. The Port of Long Beach saw its 2018 container volumes through November rise 7.3 percent to 7.35 million TEUs. The Port of Oakland saw container movements up 5 percent at 2.3 million TEUs over the same time. The Ports of Seattle and Tacoma report year-to-date container growth of 1.7 percent, reaching 3.4 million TEUs. Delays at Port are “absolutely unacceptable,” Seroka said. The delays cut across the neighboring ports of Los Angeles and Long Beach. But Los Angeles remains the more challenging for drayage drivers. The Harbor Trucking Association’s November data for truck turn times show Los Angeles terminals were at 90 minutes while Long Beach terminals showed an average turn time of 71 minutes. To speed pick-ups, Seroka says the port wants to revamp two major parts of moving containers: finding chassis for mounting container and truck appointment systems. Lance Theobald, a former marketing executive for chassis provider DCLI and founder of SecurSpace, says supply imbalances at the port’s six major terminals leads to difficulties for drivers in finding chassis. The Pool of Pools, the main chassis leasing group in Southern California, stores chassis across all the major container terminals at Los Angeles. During the peak season demand, Pool of Pools said it increased Los Angeles supply by 2,000 to 67,700 chassis. The Pool of Pools currently uses an electronic data interchange system for counting chassis as they come into the port. But the on-site inventory remains the responsibility of each terminal. But the Pool of Pools said one location would “have to be extremely large since every day there are between 27,000 and 34,000 chassis on terminal.” It said it has not heard of any specific plans for a central chassis depot. Along with chassis availability, the appointment system for picking up containers is also considered one of the chokepoints at the Port. In November, the Port adopted the PierPass 2.0 program, which requires the terminals to provide two-hour appointment windows for picking up import containers. Coming off the high of Christmas, I see a looming disaster happening in Los Angeles right now. There are significant back logs of cargo not getting out of terminals. Will the free time be extended? But the terminals have not implemented a single system for booking appointments, rather leaving each terminal to run and operate its own booking system. 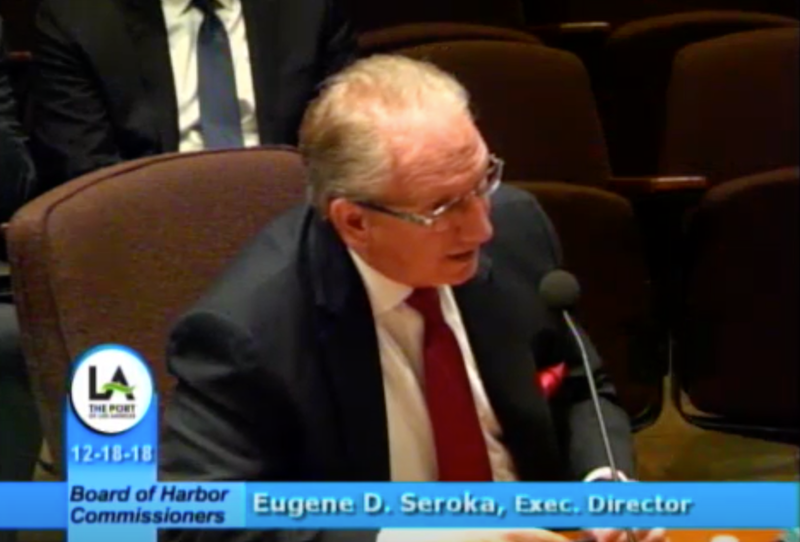 Seroka says the GE Port Optimizer program, which seeks to ease traffic flow through the terminals, is looking at developing a universal appointment system for the port. But a representative of PierPass says the terminals did not commit to a common appointment system since the bulk of truck moves are at only four of the twelve terminals in Los Angeles and Long Beach. “Therefore, these trucking companies would be making appointments at only four different appointment systems, not at all twelve terminals,” PierPass said in a statement.